BREAKER MORANT by Kenneth G. Ross, presented by The Troupe Theatre at the Reginald Theatre at the Seymour Centre, sponsored by the Australian Defence Credit Union (ADCU). 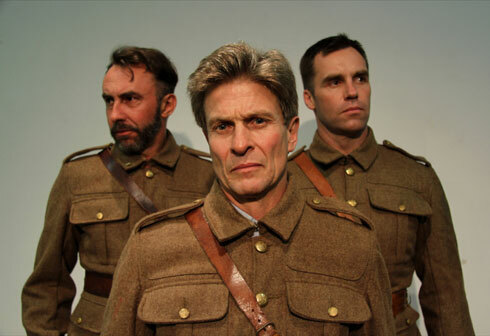 BREAKER MORANT by Kenneth G. Ross, A Play in Two Acts was first presented by the Melbourne Theatre Company in 1978. Bruce Beresford adapted the play for a film which was released in 1980 to much acclaim, starring Edward Woodward as "the Breaker" with Bryan Brown, Lewis Fitzgerald, Jack Thompson and many other important actors of the time. The film won 10 AFI Awards and the screenplay, using this text by Mr Ross, was nominated for an Academy Award. Indeed, the principal joy of this production of the play led by Director Gareth Boylan, is the direct, gloriously familiar and sturdy structure of the court room drama form of the writing. That there is drama, and that one knows what is actually happening moment to moment from the beginning, in the middle, and through to its end, so incontrovertibly clearly and cogently, is such a recently rare experience in Sydney Theatre going, that it felt almost like new form of dramatic literature. I enjoyed myself immensely - I have never seen the film and had no comparison of experience of the subject matter. I should add that this sense of security was principally emanated from the writing, for on the opening night there was a great deal of either nervousness or unpreparedness apparent from the actors - memory and line fluffs galore. On a towering wooden slatted set design with wooden tables and chairs, giving the impression of a hastily convened field court room, with the actors dressed in authentic looking uniform/costumes (Set and Costume Design, Jessica Martin), the style of production, with the actors seated chorus like along back benches, aims for court room pragmatism and efficiency. The lighting by Teegan Lee, is atmospheric and targeted - everything is well focused. Mark Lee as the Defence, Major Thomas, gives a terrific, very well delineated performance of an efficient officer with a growing sense of the staining of his personal integrity in what becomes more and more, an unfair place of argument of proof for his clients: that his clients are being made the 'scape goats' for the gain of political face by the British Government with the German authorities. James Lugton as the Prosecuting Officer, Major Bolton, is also deft in his ability to humanise the writing that is fairly straight forward in its demands - based on historic figures, the research outside the text, would be invaluable to flesh out the writing. Chris Miller is also especially interesting in the revelation of the instinctive ill disciplined soldier, accused, Lt Peter Handcock, struggling against his nature, to behave properly within the obvious flaws of the military court. Some of the acting company is made up with some that have military background but little acting experience. Richard Mallet, then, as Captain Taylor gave a competent telling of his responsibility. Andrew George, an ex-soldier, now actor, in the title role as Harry 'Breaker" Morant, does not really have the level of expertise to pull this central role off and although there is an apparent will, not enough technical ability to reveal the character contradictions of class, education and personal ethics and instincts of the man. The 'romantic' conundrum of the 'larrikin' versus the 'poet' , drover, horseman, soldier is not diverse or illustrated with enough range by the actor to deliver the 'folk hero' that the "Breaker' has become. As the central figure of the play Mr George merely gets by. The strain this causes the other actors, sometimes, shows. Despite the obvious insecurities of the performance I saw, there was a supportive and professionally, relatively unflustered discipline to the proceedings of the production, I was never really distracted from the drama of the story enough to be disconnected or deflated. I had a very good time. Next day I attended the National Theatre broadcast from London, at the Chauvel Cinema, of SHE STOOPS TO CONQUER by Oliver Goldsmith. And, given the obvious oddities of broadcasting for the intimacy of the cinema, a production scaled to a live performance for the large Olivier auditorium (noisy, seemingly, in reception, in the intimacy of the cinema, shouted) it was a rollicking and very entertaining afternoon. It was also great to see the play - a silly but robust romantic comedy about class and mistaken identities sorted out progressively over two and half hours or so - not the sort of frivolity countenanced on our professional stages at the moment!!!!! But, besides that, what struck me, especially, was the applause and cheering from the audience in the London theatre at the conclusion during the curtain calls. There was such an expression of excitement and evident abundant joy. I cannot recollect, with the present programming in our Sydney theatres a similar explosion of thanks at the end of a performance for a very long time, besides the clique-led bravura at opening nights at the STC and Belvoir. Maybe, AUGUST-OSAGE COUNTY, is an exception? This element of audience pleasure seems to be, relatively, absent from our theatre going experience. And, although exuberant joy was not the overwhelming aftermath of attending BREAKER MORANT at the Reginald Theatre last Friday - melancholic elation, perhaps - there was, despite the 'problems' of divergent technique skills, a level of comprehensive enjoyment that was satisfying. Truly, I would attend BREAKER MORANT again, than ever, EVERY BREATH, or, as some subscribers have told me, dispiritedly, BURIED CITY. A production and type of play for contemplation, beyond the issues of the subject matter. The old fashioned pleasure of going to the theatre and leaving reasonably pleased, and a feeling of reasonable respect for my patronage.